I an considering embarking on a project to capture clear, high resolution, consistent images of all remaining Apple-1 boards. This is a pretty ambitious project, and I'm quite realistic that being able to photograph all boards is almost impossible...but if I don't try then I won't manage to photograph any of them. The biggest challenge has been lighting because these boards contain a mix of reflective and non-reflective surfaces. Direct lighting produces too much glare and too many shadows, so diffuse lighting is required. The other factor is ensuring consistency. This means that the lighting, camera, board position, focal length, white balance, etc. have to remain constant across multiple board photography sessions. That makes it possible to directly compare multiple boards and identify subtle differences. Before I invest much more time/effort into this project, I wanted to see if any Apple-1 owners are willing to participate by allowing me to photograph their boards in this way. I would of course enter into an agreement with the owner not to distribute these photos without their explicit permission, not use them for commercial purposes, and share high res originals with then for their own purposes (documentation, insurance, etc.). If you are willing to consider such a proposal, please don't expect me to show up tomorrow! I have a day-job and a family...but my work does take me to Europe, North America, and Asia several times per year (I live in Dubai) and can add a day or two on each trip to travel to the nearby cities/countries for a photoshoot. The photoshoot itself won't take more than one hour including editing the photos for verification by the owner. The only requirement would be a clean dry space of about 3x3 meters and a power outlet for lighting and computer. I'm curious to hear the opinions of owners and enthusiasts alike to see if anyone sees value in such a project. There's no point in doing it if no one is interested in the photos! Mike Willegal and I have high resolution photos of many of the existing Apple-1 boards, we just do not share them as we do not want to provide additional information which may allow someone to create a replica that is so accurate that at some point there could be a mistake made and it is sold as a real one. Not saying anyone would intentionally do that, but you never know if someone's family member thinks it's real and tries to sell it after someone passes away and an unsuspecting buyer pays big money for it. This happens a lot in the vintage watch community and 9 out of 10 times they are fakes. We just don't want to enable a mistake like that. Key high resolution photos of some specific Apple-1 areas like the jumper wire sections are on the internet or in condition reports that the owners generally have about their boards for insurance and authentication purposes. I agree with you that forgeries pose a real risk, but I’m not convinced that lack of publicly available information does much to prevent them. I’m not familiar with the vintage watch market, but I am knowledgeable of the vintage car market and in that case it is publicly available information that helps the community validate the authenticity of cars that come on the market. Manufacturers have often made detailed information publicly available to assist in this effort. In the case of the Apple-1, detailed records were not kept by the manufacturer and so it has fallen on the community to try and gather and share information on these objects of significant historic significance and investment value. The combination of detailed, publicly available information along with supporting documentation would be an effective way to establish the provenance of original Apple-1s. Lastly, the easiest way to create a convincing forgery would be to start with the Mimeo-1 or Newton-1 board and the parts kits that are available online. As long as those options continue to be available, and I believe they should, the creation of an up-to-date photo library and registry wouldn’t significantly increase the risk of forgeries. I believe that a simple scientific test could be developed to authenticate Byte Shop and NTI boards by looking at the composition of the PCB itself and the manufacturing technique used. Today, Mike’s registry is the only publicly available tool for perspective Apple-1 buyers to use to research the Apple-1. It has not been updated for more than two years and in many cases contains limited details. I’m trying to make more information easily available so that people like me can make more informed purchase decisions in the future. I got many inquiries about getting high-res pictures and so far it was always to get better replicas. Between replica and counterfeit It is a pretty thin line to cross. The photographer might have the honest reasons to take the pictures. But too many black sheeps are everywhere. Some people asking me about super-high-res pictures might be the nicest and honest human on the planet, but others are not. If someone asking for pictures of the back and pictures of conducting paths under ICs than sorry, that rings a bell. To make this clear: I totally understand people wishing to get a nice replica. BUT, if someone telling me he wishes a replica with even correct conducting paths in invisible sections, than NO. There is absolutely no respectable reason for this. There is only one reason for such a request: producing counterfeits. Even the biggest fan would not notice nor can he/she see what is under the chips. Any reliable collector or Apple fan will be happy to get a nice replica and will not need a counterfeit. Of course you might not stop people from breaking into your house but luckily most Apple-1 owner will not handle the keys to those. I am missing too better pictures but I agree with many other people that high-res picture and particularly macro shots could be a problem. To update Mike’s Registry I would help and even would try to publish more pictures but not as detailed as some people asking for. Such a detailed information screams for a construction plan to produce better fakes. The registry is a wonderful tool to make sure, many as possible Apple-1 are registered and some pictures exist. If someone selling an Apple-1 everyone will compare the information with this list. So to come up with a “new find” will be pretty hard. If someone try to make a counterpart of existing Apple-1: Wow, that will ring a bell, as every Apple-1 is unique and the original owner will complain. From my Apple-1 I will publish some pictures but I will not provide detailed pictures of every component nor conducting paths. And any reliable museum will deny as well. If Mike or Corey would ask a pretty special detail of my Apple-1, than yes. But both guys already know more or less any secret. And Corey already worked with on of my Apple-1. So Jimmy, your idea is nice but think about working-over some parts of your plan. I guess nobody would like to be responsible that some black sheep’s use your work for making fakes. And if you publish too detailed information you are responsible. I think I wasn't clear in my original post and that has caused some confusion. My intention is to shoot only one photograph of each Apple-1, similar to the sample shown in my original post. I don't plan to photograph the back, below the ICs, etc. You could think of it this way: if Apple-1s were people, my intention is to photograph portraits not nudes. I want to create a family album, not an anatomical reference. 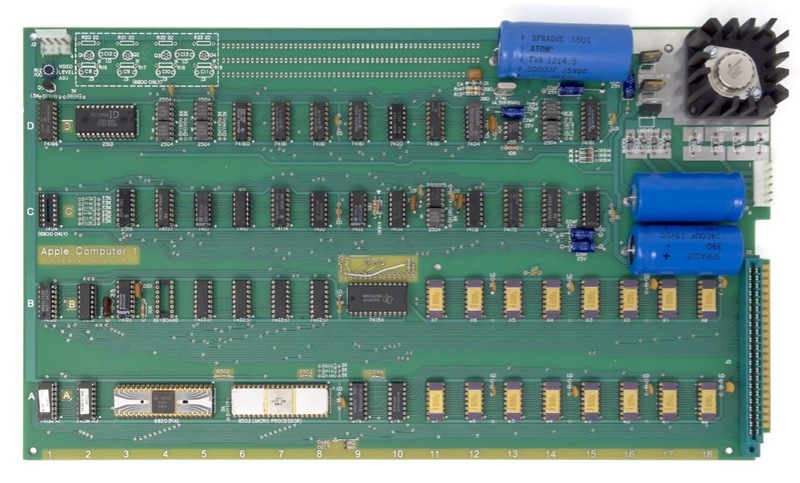 For simply cataloging all remaining Apple-1 boards and their main components, a single high res "portrait" is sufficient. Further detailed photos such as the one you have been requested could be used for nefarious purposes that we all would like to avoid. As someone who eventually intends to buy an Apple-1, the last thing I want to do is contribute to creation of perfect forgeries that cannot be distinguished from the original. I do hope you are able to work with Mike & Corey to update the registry. I simply want to contribute to that effort by providing consistent & clear overview photos of the top of the boards. Do you both feel this is a more realistic and acceptable approach or do you still have concerns? If you are interested in updating the registry, I will not get in the way. As long as you credit the source(s), you can leverage whatever you want from the current version of the registry and move it to whatever site you decide is appropriate. I will not complain and if you do a good job, I have a quite a bit of additional data that I could share with you.